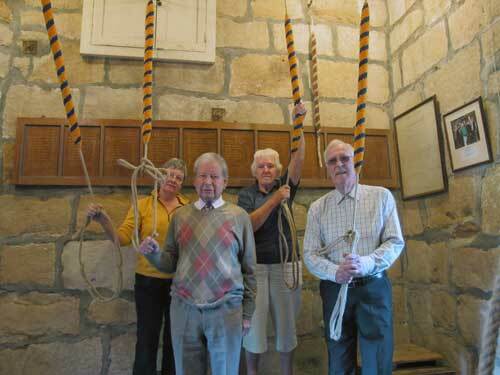 Guiseley belfry took delivery of a full set of eight new ropes from Peter Minchin in 2011. The sallies are coloured in gold and blue taken from the coat of arms of Guiseley. 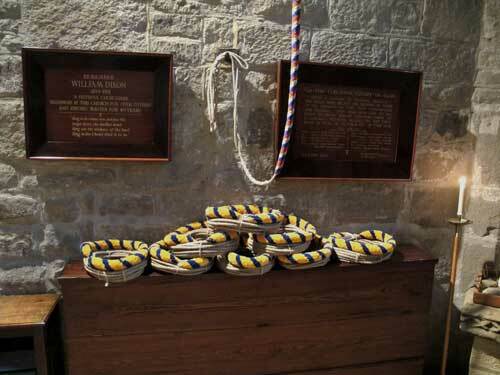 The ropes were blessed during the Confirmation service by the Right Revd and Right Hon Dr David Hope on 5 June 2011.
with Jan, Jeff, Kath and Brian. The Ringing World is the magazine for bellringers and celebrated its centenary in March 2011. Its first edition in 1911 included a peal rung at Guiseley (a peal is continuous ringing for about 3 hours). We arranged a peal to mark the centenary in 2011 and a peal of Upminster Surprise Major was successfully completed on 20 February 2011. The band included local band member Jeffery Cooper, shown here on the left.